Jeff MacDonald is a cultural heritage scholar, educator, and specialist in the preservation of historic building materials and historic built environments. For over 20 years, he has remained active in preservation and the advancement of cultural heritage education in the US and worldwide. He has also carried out research into cultural heritage policy, education, and stewardship. Jeff continues to explore international partnerships in the development of locally sustainable heritage systems, and place-based models. He holds a Masters of Fine Arts in Historic Preservation from Savannah College of Art & Design, and is currently a Ph.D. candidate in Cultural Heritage & Applied Anthropology at the University of Montana. The Montana History Foundation is a 501(c)(3) charitable foundation that provides funding for history and preservation across Montana. Established in 1985, the Foundation seeks to preserve the legacy of Montana’s past with an eye on the future. Their central goal is to generate public support to save the rich cultural heritage and historic resources of Montana. The Foundation is providing a generous grant to help fund AiP's 2019 project. Take this opportunity to join the Montana History Foundation and support conservation at Bannack ghost town. Montana State Parks manages 32 sites within its 55 state park system that are eligible or listed in the National Register of Historic Places or are designated National Historic Landmarks (NHL). Bannack State Park is an NHL and one of the best-preserved ghost towns in the American West. State Parks successfully partnered with The University of Montana, Montana State University, Colorado-Mesa University, Museum of the Rockies, and Montana Preservation Alliance to complete research, documentation and survey projects. We are pleased to add Adventures in Preservation (AiP) as one of our valued partners. The University of Montana (UM) is a leading public doctoral research institution in the Northwest with eight Pulitzer Prize winners, over 30 Udall scholars, and ranking 17th in the nation among public universities producing Rhodes Scholars. As a core institution of higher learning, UM Department of Anthropology’s emphasis on cultural heritage issues results in student-oriented research that engages with Montana’s community-based needs. As one of those most committed to engaging the needs of Montana, Jeffrey MacDonald has conducted doctoral research at UM that cultivates opportunities for sustaining built heritage via multi-agency partnerships. 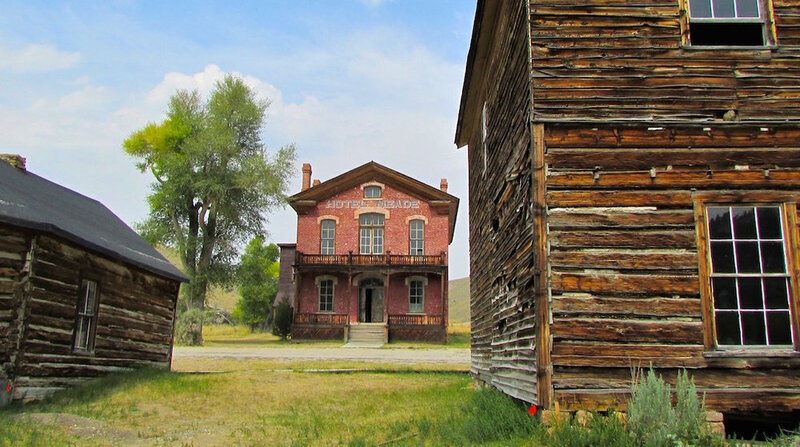 Together MacDonald and UM Anthropology Professor Kelly Dixon are collaborating to connect UM students, veterans, presentation advocates, and volunteers via the Bannack Heritage Preservation Workshop. Travel health insurance, if coming from outside the US. Learn specialized preservation treatments to help sustain Montana’s built heritage and uncover valuable historical archaeology. A flash flood tore through Bannack, Montana in 2015. Rushing water damaged many of the sixty historic buildings still standing in this 1862 gold rush ghost town. Work began immediately to address problems in order to save a remarkable remnant of the old west. Jammers (AiP volunteers) will have the opportunity to learn from specialists with expertise in both preservation and archaeology. Bannack was founded in 1862 when gold was discovered on Grasshopper Creek. As news spread, many prospectors and businessmen rushed to Bannack hoping to strike it rich. In 1864, Bannack was named the first Territorial Capital of Montana, and continued as a mining town into the 1930’s. By the 1950’s, gold had dwindled and most residents had moved on. At that point the State of Montana declared Bannack a State Park. There are very few ghost towns of this size remaining in the western US that still encapsulate this engaging and important era of American history. Saving the town requires creative solutions, and you can be an important part of the effort. What is truly amazing about AIP is that they bring together people from different areas, backgrounds and skill sets who all share a similar driving interest. We come because we love history and want to become a part of its rediscovery and preservation. An innovative partnership has been formed between the University of Montana, Montana State Parks and Adventures in Preservation. The vision is to establish an institute for preservation education that also encompasses historic archaeology and cultural landscapes. Be among the first to explore the interface between preservation and archaeology in the repair of foundation systems. Hands-on work will provide an outstanding experiential education. Apply mortar and daubing to historic buildings. Specialized training varies by session and building, which range from log structures, wood frame construction to masonry, plaster and historic finishes. We will also be involved in archaeology around damaged foundations beginning in 2020. Your participation addresses a critical need to find a sustainable method to offset costs of preservation and maintenance treatments. Jammers will stay at the Fairbridge Inn Express in Dillon and eat breakfast at the hotel. Lunches will be provided on-site. Dinners are at your own expense, but we will try out several of Dillon’s restaurants and go as a group. The hotel offers a newly renovated indoor pool, a fitness center, free wifi, microwave, refrigerator, AC and free parking if you choose to drive. If you prefer, there is the option of lodging and breakfast in a dorm at the University of Montana Western campus. There is also the option of camping near the work site. If camping, you will need to provide your own breakfast, as well as dinner if choosing not to drive into Dillon. Your project fee of USD990 per week covers the cost of lodging in a double room, breakfast and lunch, onsite instruction, transportation to & from the airport, transportation to & from work site, and excursions. If you prefer a single room, an additional single supplement of USD300 will be added to your fee. If you prefer staying in the dorm, your project fee is USD840. If camping, your project fee of USD790 covers the cost of your camp site, lunch, onsite instruction, transportation to & from the airport, and excursions. We will visit Big Hole National Battlefield, where the Nez Percé fought a delaying action against the 7th Infantry Regiment August 9-10, 1877, during their failed attempt to escape to Canada. You’ll also have the option of visiting the Jackson Hot Springs, or experiencing world-class fishing on the Beaverhead River. Equipment is available to rent. Given all there is to see and do in Montana and the surrounding mountain west, you might consider extending your visit, before or after your project session, to take advantage of the area’s many historic and natural sites. I spent an amazing week with wonderful people and I would recommend everybody to live this unique experience. If arriving by air, the nearest airports are in Bozeman, Montana or Pocatello, Idaho. Airport pickup is available at Bozeman Yellowstone International Airport at 2pm on Sunday. Rental cars are available at both airports. Drive time from Bozeman to Dillon is 2 hours, and drive time from Pocatello is 2 hours 45 minutes. August in Montana brings daytime highs between 75 and 92 degrees F, with an average high of 83 F/28 C. The average low is 46 F/8 C. In September, the average high is 73 F/23 C and average low is 40 F / 4 C. With an altitude of 5240 feet, temperatures often cool rapidly in the evening so bring attire suitable for the weather that will also be protective while working. Sturdy close-toed shoes required; water bottles, insect repellant and sunscreen are recommended. Please be conscious that safety is an important issue at any work site. Immerse yourself in the history of the great gold rush – Register today!